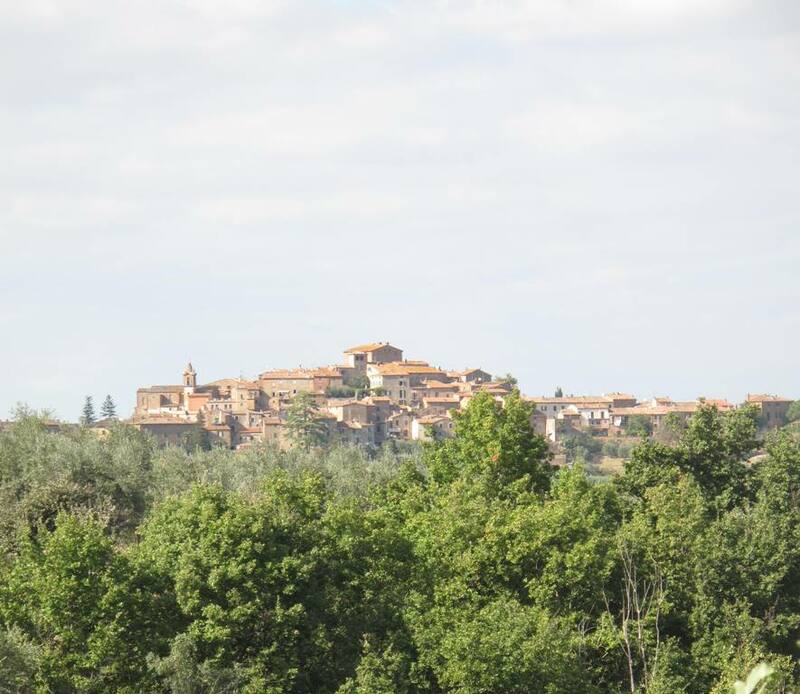 The approach to Montisi, a small Tuscan village that has been our home this week. Detail: An autumn bouquet from a Tuscan garden. 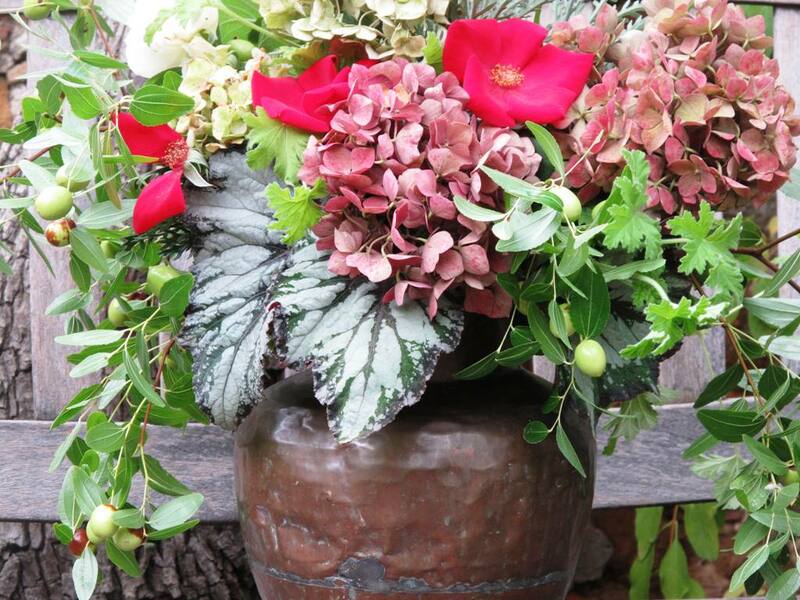 Olives, roses, hydrangeas, scented pelargonium leaves, Rex begonia leaves – seen here. This morning at the villa, two friends went off for watercolor lessons with resident expat artist Liz Cochrane. After walking down to Il Barrino for hot tea and a croissant, I came back totally determined to make a bouquet for our group’s last night together. 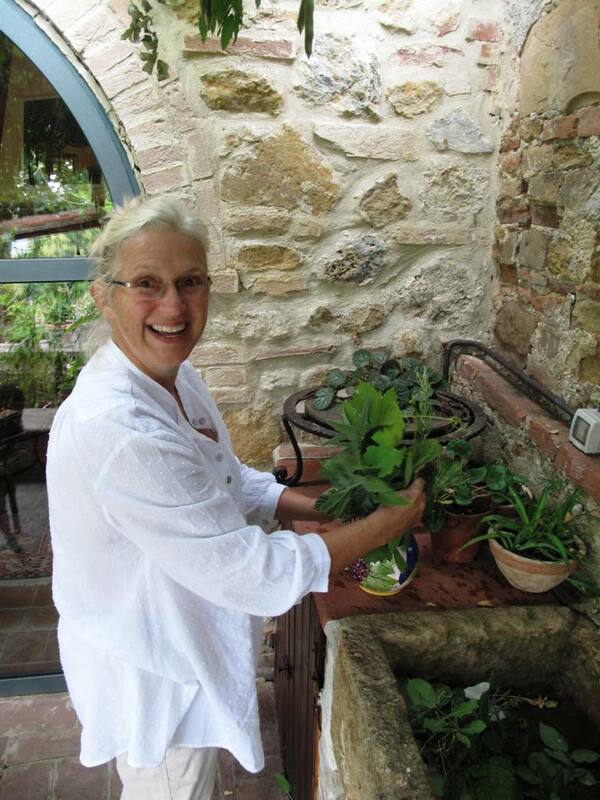 The Flower Arrangers’ Guild of Tuscany commenced its first session. This garden is in its waning moments of late summer-early autumn. But it does not disappoint. So much to work with and we judiciously snipped, without hurting or denuding a single plant. I had spotted a copper urn, weathered and slightly dented, sitting on the floor in the Lemonaio (the garden room). It inspired my palette – faded, tarnished and of the moment. 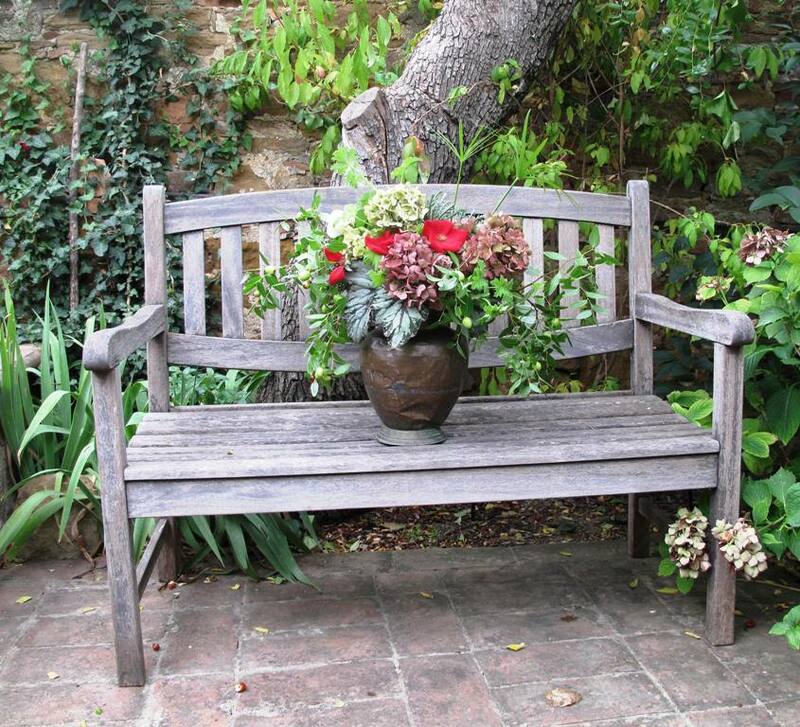 A rustic wooden garden bench, a perfect place to display and photograph my Tuscan bouquet in a timeworn copper vessel. Mary Watson, a new friend who I met through Marty Wingate. She is an art educator and bon vivant! Right when I started arranging this morning, Mary jumped into the fun. 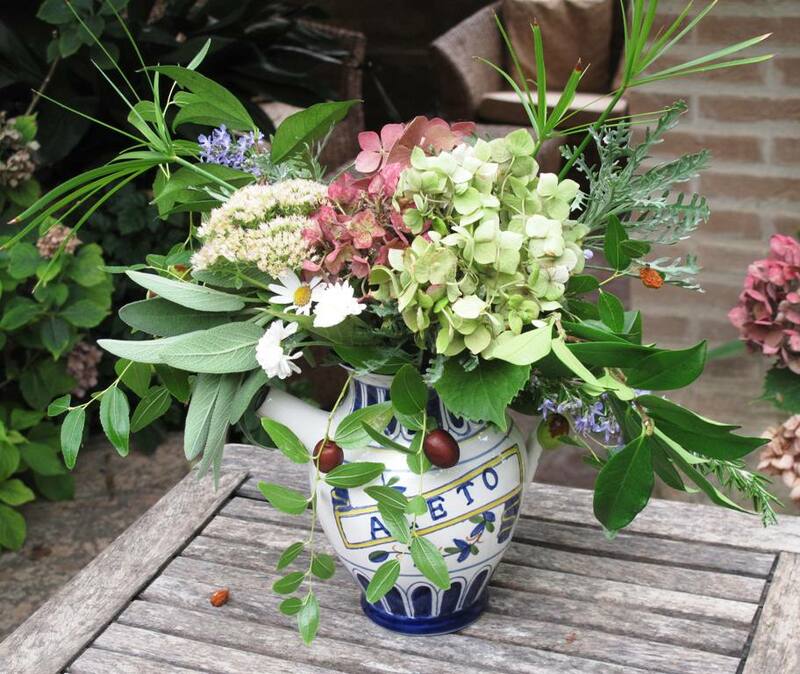 Here’s the partner bouquet to Mary’s olive oil jug creation. 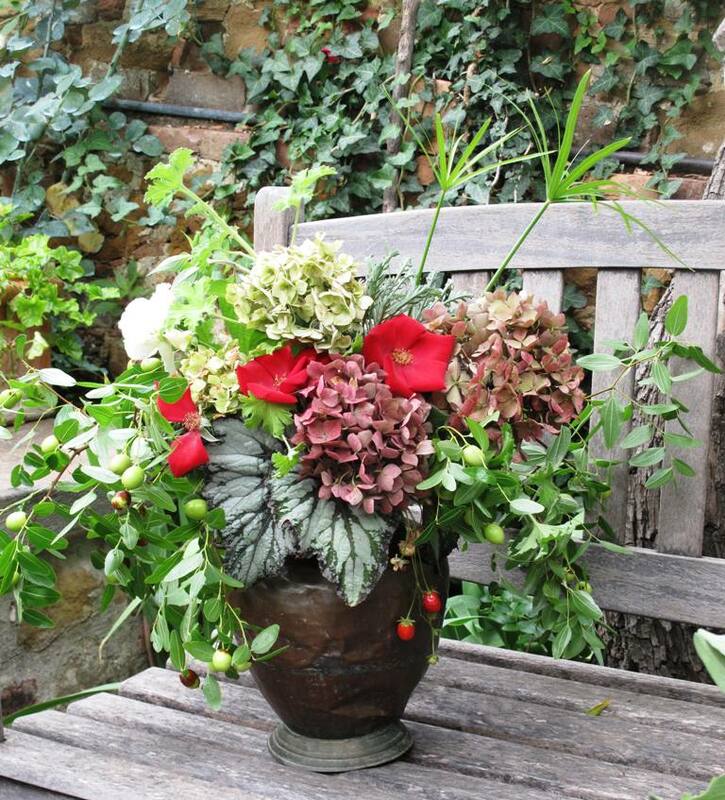 Here, she used olives, Sedum Autumn Joy, some tiny white crysanthemums and Marguerite daisies, as well as a few springs of rosemary. An olive oil jug is part of a matched set (the other one is a vinegar jug) that Mary Watson used for her two companionable bouquets. The sage is gorgeous with the hydrangeas. 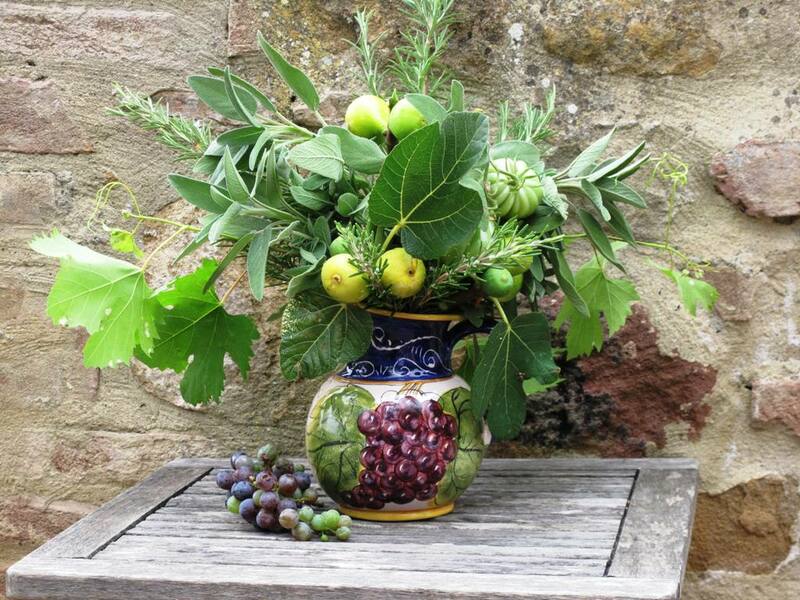 And Victoria harvested figs from the garden’s ancient tree laden with ripe fruit. 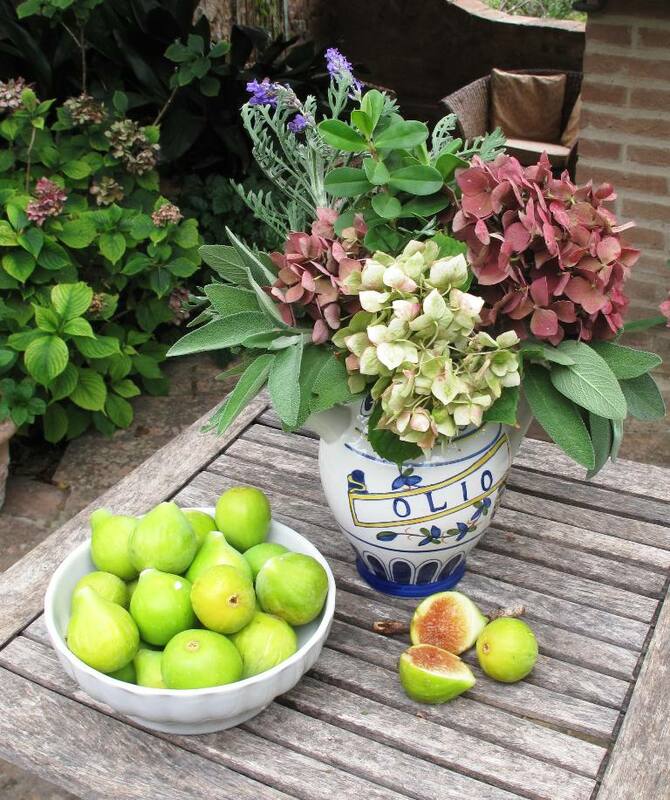 A Tuscan still-life. 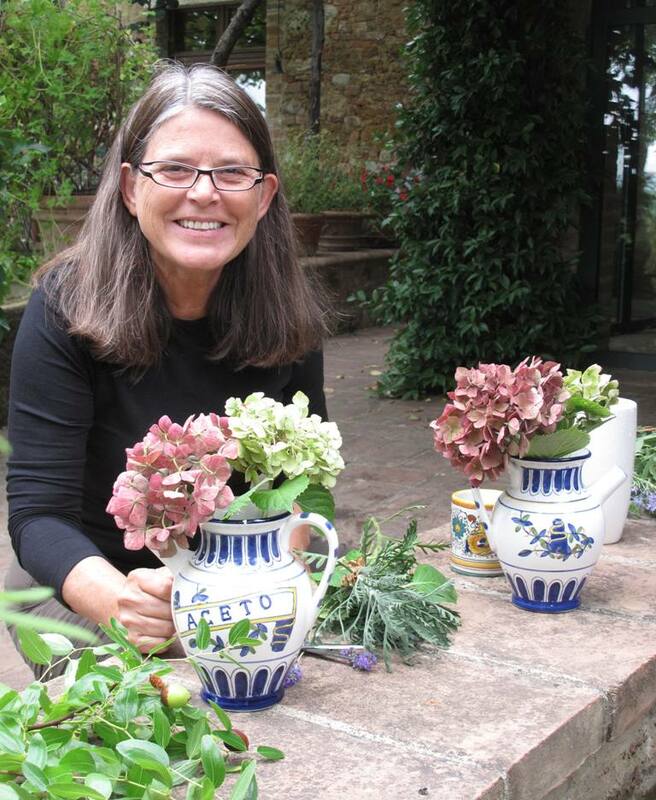 British friend and fellow garden writer Victoria Summerley. She created an all-edible bouquet in a pitcher embellished with grape clusters, natch. Grape vines, fig foliage/fruit, rosemary, tomatoes, sage, rosemary and a cluster of grapes. Bella Victoria! If you want to learn more about Victoria’s work, visit her blog: Tales from Awkward Hill. The art students are back for lunch. A few enterprising chefs have whipped up an al fresco meal by clearing out everything in the refrigerators. Cheeses, prosciuotto slices, apples, cucumbers, tomatoes, pasta and pesto, or pasta and homemade tomato sauce, lots of wine. We’re hoping those with watercolors and sketch books will render our bouquets as little canvases after lunch. 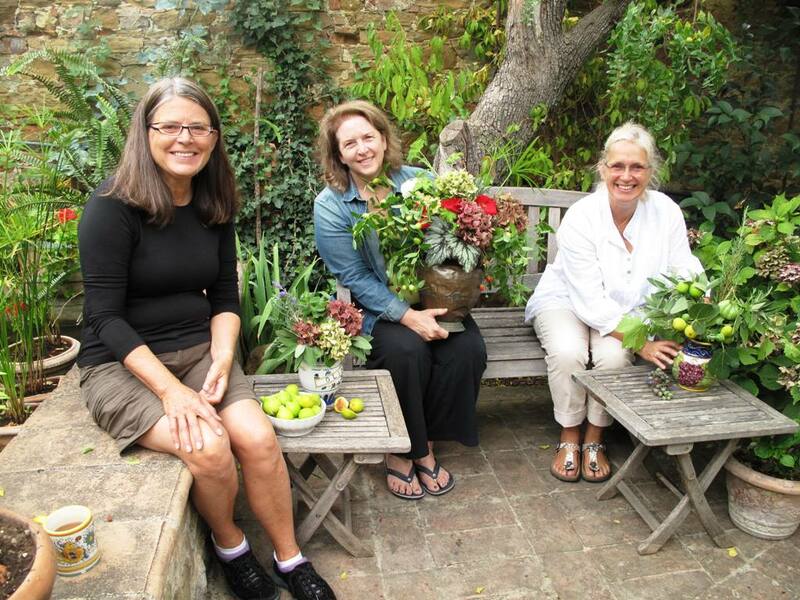 I’m sitting in the garden with my fellow designers, Mary Watson (left) and Victoria Summerley (right), as we show off our bouquets from this morning’s sponteous floral session. I thought I was finished with this vase. Then Mary gave me an armload of extra ingredients and challenged me to use them. All of the bits and pieces fit perfectly in a contemporary cream-colored IKEA vase. Except for the strawberries. I took one look at my copper composition and knew the red berries would speak to the red roses. Voila! Now it is complete. This entry was posted on Friday, September 27th, 2013 at 4:46 am	and is filed under Blog Posts, Creativity, Entertainment, floral design, Gardening, General, interior design, Landscape Design, Plants, Playfulness, Writing. You can follow any responses to this entry through the RSS 2.0 feed. You can leave a response, or trackback from your own site. What a lovely time spent with friends! All the impromptu arrangements capture the time and place, just delicious!